Our 'What TV do you have' poll finished few days ago and the results weren't surprising at all. As we expected Samsung, Sony and LG are the most popular TV brands in the world. As it looks like they have taken more than 50% of the market share and with their current positions I am sure this trend is to last much longer. Since the very beginning of the poll itself Sony took the lead with few votes difference from Samsung. On the final straight Samsung won the title with just couple of votes ahead of Sony. LG was the absolute N3 in this chart from the beginning till the very end. 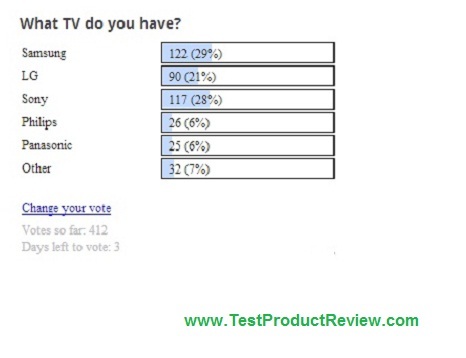 As I said these results were quite expected as we have reviewed plenty of TVs from those brands and compared to other brands the interest is just enormous. I would recommend you to take a look at our selections for Best 32-inch Full HD TV, Best 32-inch LED TV for 2013 and Best 42-inch Full HD LED TVs for 2013 where you will find some great TVs from Samsung, Sony, LG and few other brands. 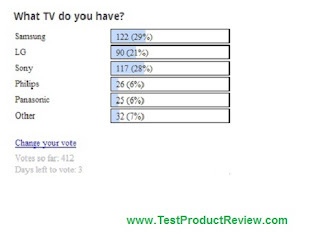 Expect more interesting surveys in our Test and Review blog in the near future and we will love it if you take part, vote and comment in these as your opinion is very important for us and for consumer electronics manufacturers.